As one of the site's leading contributors of images it's inevitable that I'd build up a collection of screenshots that aren't really suitable for the wiki but are too beautiful not to use somewhere. I'm going to use this page to show off some of the best. A while ago I revisited Kvatch to play the excellent Kvatch Rebuilt mod. Leaving the city one morning and taking the direct route to Anvil I couldn't help but be impressed by this sunrise over the Wayshrine of Zenithar. I haven't gone five minutes without finding something screenie-worthy in Skyrim but this is my first shot. Masser and Secunda and a huge auroral display. Just lovely. Who says Bravil is an ugly city? Well... it is, but get everything lined up just right and it has a certain rustic charm. I'd just leveled up by sleeping in my Bravil home and came outside to see this. The Bridge carrying the Red Ring Road over the River Niben. I got this when I was looking into exactly where the regions ended and must have spent an hour grabbing shots of this bridge. It's the lonely Imperial Guard that really makes it for me! Necromancers spend too much time indoors. If they stepped out of their underground lair just a few hours before sunset rather than just after, they'd realise just how beautiful the world can be. The KotN plugin newly installed I went to talk to the Prophet. Turning around again, this was what I saw. I started a new game and went looking for the ever-elusive Ring of Destruction that lies somewhere beneath Fanacasecul. At one point when I came up for air I saw this picture and took a snap. Eerie and atmospheric about sums it up. Another sunset, but isn't it a good one? This is the double lake to the southwest of Nenyond Twyll / southeast of Nisin Cave. This one was sort of planned. I was running around the area and found the lake (see Waterfall below) and but decided a sunset shot would look even better. This one is taken from the east shore, looking across towards the Ayleid Well on the hill to the west. I have no idea where this one is although I'd guess it's somewhere in the Great Forest near Chorrol. I've mentioned elsewhere that the Almost Everything Visible With Distance mod is excellent, so what happens when you make that mod even better then add another? The Unique Landscapes are stunning, and RAEVWD really shows them off. In this shot, I had just installed RAEVWD and had followed the path added by one of the ULs. Since I could finally see Frostcrag Spire in the distance, I took a shot. I'd gone to Gnoll Mountain to check something out and noticed the two moons together in the sky. I thought a dramatic shot of Frostcrag Spire against the moons would work well and used the console to make sure the weather was perfect. The only problem is that it's difficult to get it bright enough without ruining the moment. This one was pure luck. I coc'd in to Garlas Malatar to grab the external map for the Oblivion Places Redesign Project. As soon as the load screen disappeared I was presented with this scene of the sun setting over the Abecean Sea. Running back from Anvil, still trying to boost my Athletics skill, I was going to pop into the Gottshaw Inn to invest and saw this. Having completed the game and got my speed up to 100, I usually run rather than fast-travel. I also usually take the direct route, so to get to Chorrol from the Market District I head towards the Prison District and turn west. In this case I saw the sunset and decided to set up a shot. I'd started a new game and was exploring the land as well as doing some of the easier quests. I'd just been to Roland Jenseric's Cavern and decided to get a couple more map markers. Heading back from Belda I saw this scene of the sun setting over Lake Rumare. I finally succumbed and started the main quest. 60 gates to go and counting... They're dull but not all bad; this dramatic shot presented itself to me whilst doing my first gate after Kvatch. This one came just after Frostcrag and Moons. I saw the line of the mountains and decided a shot of the sun rising from behind them would be perfect. Luckily the cloud I'd banished for the previous photo had come back. This one is already on the site but it's so beautiful I want it here too. I seem to remember I was ambling aimlessly around to the south of Skingrad looking for wayshrines when this scene came into view. Unfortunately I always used to mix up Skingrad and Cheydinhal, hence the rather inaccurate name. Having finally got to the right level I was on my way to Mephala's shrine, taking the direct route, and saw this scene. This one is taken with Quarl's Texture pack and the various LOD fixes installed as well as the Natural Weather mod so it looks even better than usual! This was taken not too long after Lake Rumare and the Imperial City. I'd done the quest and was on my way back from Bleaker's Way when I happened to turn right and saw this. I thought it'd be nice to have an image that didn't involve a sunrise or sunset for a change. One advantage of checking all the UESP edits in-game is that you find yourself heading all over the map. I'd been in Kvatch and was heading to Dunbarrow Cove to check some bug or other and caught this shot of Anvil Castle, Anvil Lighthouse and the sun. Shame about the light glitch on the water, but it's still darn pretty. I had just reinstalled the KotN mod and was going around the wayshrines again. I think I caught this one perfectly. The sun is right on the horizon and the incredible light on the water sets the whole scene alight. I'd just stamped the forged candidate list and was heading back into the Market District for a little light thievery when this appeared in front of me. This is another image with various patches installed. Another one taken with mods like Quarl's Texture Pack and Natural Environments, and boy does it show! I was swimming back from Leyawiin to the IC (boosting Athletics can be such a pain!) when I stopped off at Fort Grief to see if the Shadowbanish Wine had respawned yet. On the way back out I saw this incredible sunset and just couldn't resist. This lake is one of the land's best-kept secrets. It's due north of Outlaw Endre's cave, east of Underpall Cave and has a nirnroot growing on its shore, but it's a little way off the beaten track and often gets ignored. I always seem to get both the random gates by the Inn of Ill Omen and the Faregyl Inn. I did the first one then decided to try and get a shot of the gate destruction shot on the second. I've always liked that effect. Sent to Autumnwatch tower to kill a dragon for a bounty, I found Masser and Secunda in their full splendour during an auroral storm. Add a dragon banking to starboard to execute its attack, and you've got a pretty spectacular image. The Morrowind Graphics Extender is a must-have if you enjoy Oblivion. It lets you generate a distant view of the world, meaning that the horizon moves from being about 100 yards away to being almost limitless. In this shot, you can even see the island of Solstheim from Ald Velothi. Look at the map to see just how far that is. Looking across Niben Bay past A Strange Door, towards Fort Grief and Cadlew Chapel. Leaving Bravil one morning and heading off into the Shivering Isles I saw this shot and remembered just why I love Oblivion! It's got everything - the mountains reflecting in the water, a moon and of course, a sunrise. It's a version of this without clouds that makes the right-hand image on my user page. I'd been thinking about the discussion over whether or not to make my Sky's Alive picture a Featured Image and I realised that sunsets and sunrises weren't as spectacular in SR as they were in OB. Of course, the game immediately threw out this image to prove me wrong. Another example of how Morrowind can be nearly as pretty as Oblivion. I was taking the direct route from Bruma back to the Imperial City with the wonderful Almost Everything Visible With Distance mod installed when I caught sight of this. Just how many dungeons, particularly Ayleid ruins, can you see in this shot? And can you name them all without cheating? This one was totally contrived. 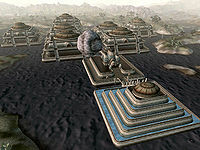 I wanted a picture showing the whole of Vivec City and the layout of the city means the shot has got to be taken from the south. This shot uses the excellent MGE mod to get a long horizon. Morrowind isn't in the same league as Oblivion when it comes to graphics, but it's still not exactly ugly. 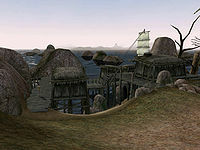 I was wandering around Vivec at dusk and saw this image. This double lake (map) is one of the most beautiful places in the game. A quick run through the West Weald brought me to its shores and I decided I had to take a photo for the album. It gets even more beautiful at sunset! Skyrim doesn't seem to get the spectacular sunsets you can see in Cyrodiil, but they can still be pretty good. I'd just sold a load of stuff at the local fence, stepped outside and saw this awesome view of Whiterun. I've had these for ages and keep meaning to expand the articles on the Nine Divines to justify their inclusion. Rather than risk a hard disk crash I'm uploading them and sticking them on here for now.